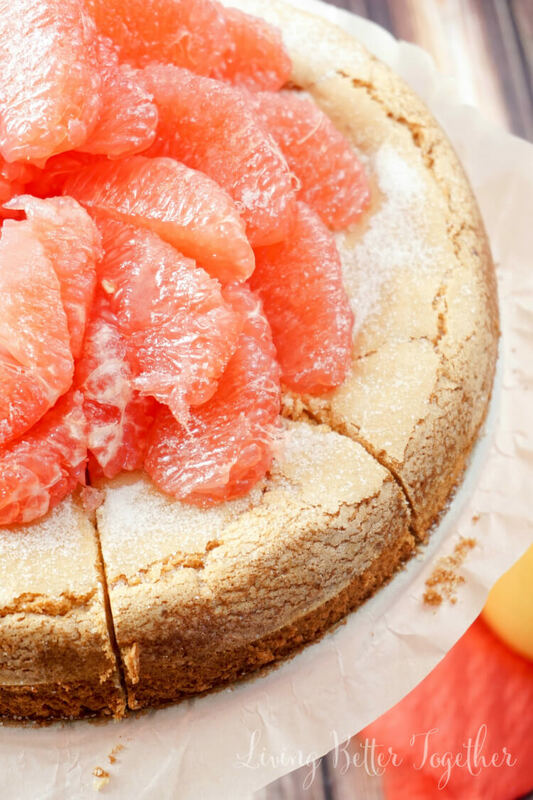 This light Olive Oil Cake is brightened up with fresh and vibrant Florida Grapefruit making it perfect for brunch or dessert! It’s just 5-ingredients and 300 calories per serving, are you in love yet? You guys know I love working with fruits that are in season, but that can be hard in the winter months, especially here in Maine. Luckily, Florida grapefruits are harvested from October through April and are at their peak in January! Since just one half of a Florida grapefruit contains more than 100% of your daily vitamin C and helps boost your immunity, they make the perfect fruit to mow down on in the winter! Growing up, I LOVED grapefruit, mostly because I got to use those really cool spoons with the teeth at the end when I ate them at my Nana’s. I finally got a set of grapefruit spoons a couple years back, because I still love my grapefruit! I’m one of those people who can easily drink a gallon of grapefruit juice and not think twice about eating one after. They’re just so good! Just them smell of them is energizing, don’t you think? I’ve always just eaten grapefruits plain or baked for breakfast, or in the occasional salad or cocktail. But I’ve been thinking that such a gorgeous fruit with so many health benefits deserves to shine in dessert. After all, dessert is what I do best! 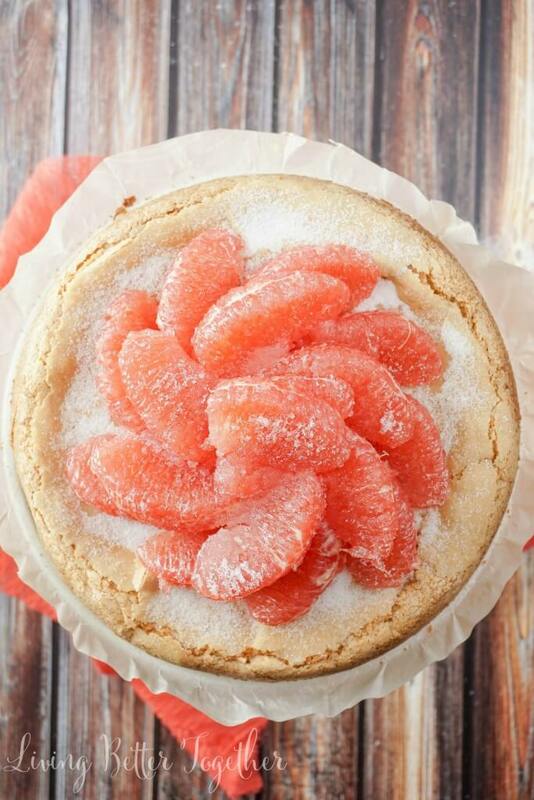 I’d love to be baking in the Florida sun and picking grapefruits right off the tree this morning. Instead I’m here in this blizzard in Maine so I’ll try to bring that dream to life as best I can and bake a grapefruit cake! Since grapefruits have so many amazing health benefits, I wanted to keep the cake nice and light in texture, flavor, and calories. 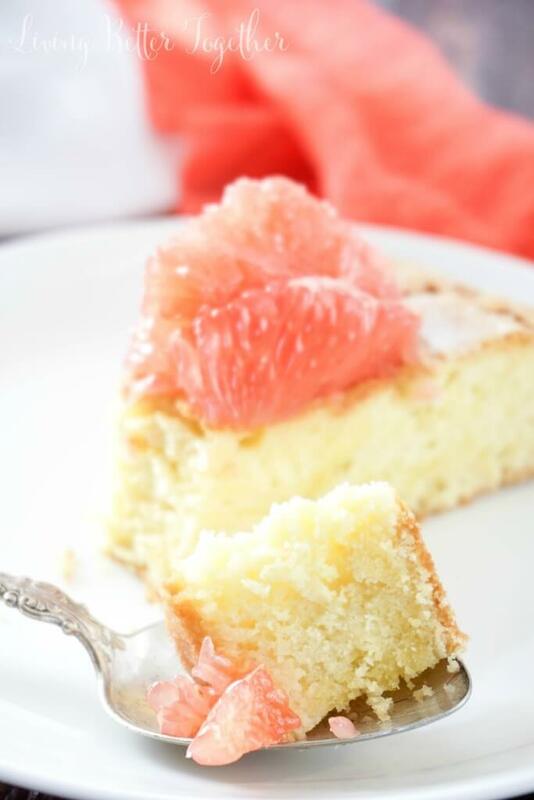 This Grapefruit Olive Oil Cake is just that! With only 5 ingredients and only 300 calories and 7 PointsPlus per serving, this cake is the perfect sweet treat to keep you in check! Florida’s unique fertile soil and lush subtropical climate are what make Florida grapefruit the sweetest and juiciest variety of grapefruit in the world, but they can also take a toll of the outer appearance of the fruit. So don’t judge a book by it’s cover, what’s inside is absolutely vibrant and flavorful! I mean, just look at how gorgeous that grapefruit flesh is! So let’s get back to this cake shall we? Olive oil cakes are very light and fluffy, but have a tougher crust. Almost like a cross between a chiffon and an angel food cake. I love the way the crust cracks during baking, it gives the cake such a rustic finish! 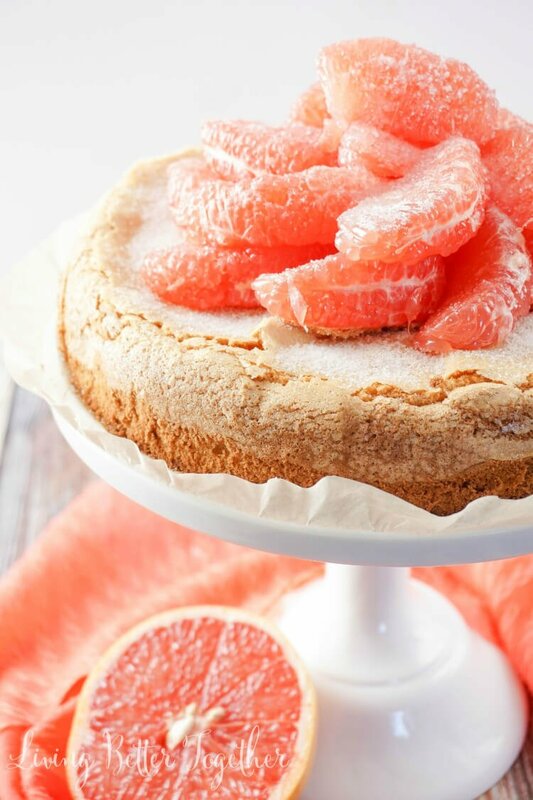 The cake itself is light in flavor with a hint of fresh squeezed grapefruit juice and zest. Then it’s topped with sugared grapefruit wedges for a stunning finish that’s sure to impress. Seriously though, this cake looks so much harder than it really is, PROMISE! This cake is made with just Florida grapefruits, olive oil, eggs, sugar, and cake flour. 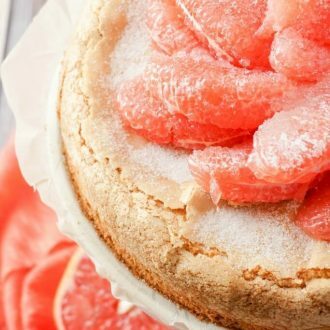 You can make the cake up to a day ahead of time and add the grapefruit wedges to the top at the last minute for peak taste and freshness. 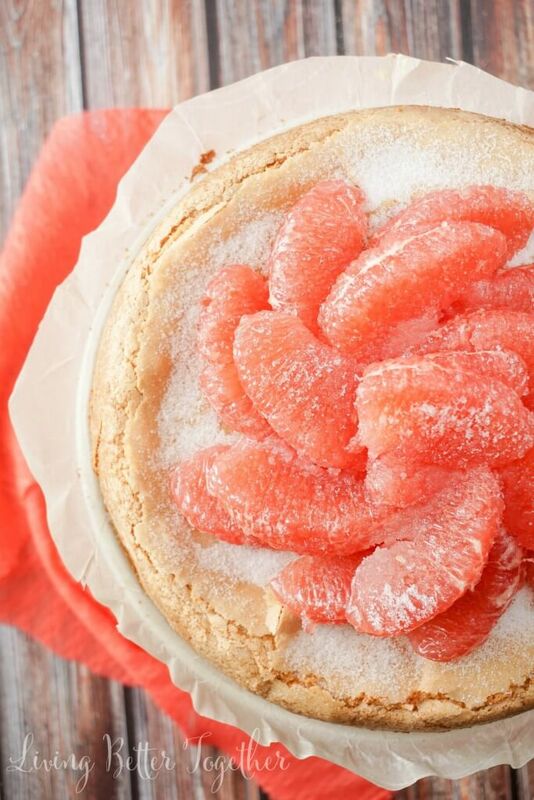 By providing your body with a natural boost in energy with significant amounts of essential nutrients like vitamin C, vitamin A, potassium and fiber, Florida grapefruit certainly makes for a great addition to your desserts! This cake is definitely something you can indulge in without feeling guilty! 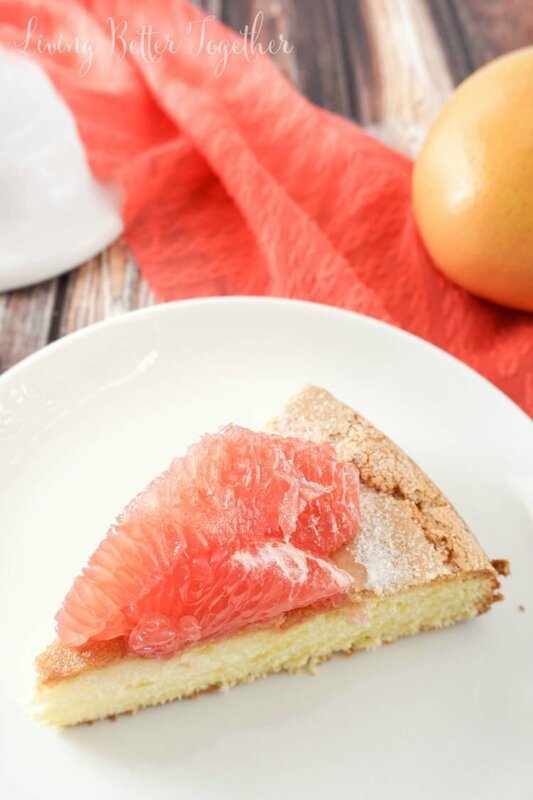 This light Olive Oil Cake is brightened up with fresh and vibrant Florida Grapefruit making it perfect for brunch or dessert! It's just 5-ingredients and 300 calories per serving, are you in love yet? Place a piece of parchment paper over the bottom of a springform pan and then clip the sides around it. Trim away the excess parchment paper, leave just a bit of a lip. Add a couple drops of olive oil to a paper towel and rub down the sides of the pan with it. Grate the grapefruit zest into a large bowl. Add cake flour to zest and gently stir and set aside. Squeeze grapefruit juice into a small prep bowl and set aside. In a large bowl or stand mixer, beat together 1/2 cup of sugar and egg yolks on high speed until pale and creamy, about 3 minutes. Reduce speed to medium and slowly add in olive oil and 3 tbsp of the grapefruit juice, the rest of the grapefruit juice can be discarded or used in another recipe. beat until just combined, mix may look separated. Use a wooden spoon or rubber spatula to gently incorporate the flour mix into the wet ingredients, DO NOT BEAT! In another bowl, or after transferring the batter to the flour bowl and cleaning your stand mixer, beat egg whites on medium-high speed until foamy. Slowly begin adding 1/4 cup of sugar and continue beating on high until soft peaks form, about 3 minutes. Gently mix in 1/3 of the eggs white into the batter to lighten in, then gently but thoroughly fold in the remaining egg whites. Gently pour batter into prepared springform pan and lightly rap a couple times on a flat surface to remove air bubbles. Sprinkle top of batter with a tbsp of sugar and bake for 42-45 minutes until cake is puffy and golden brown and toothpick comes clean from center. Cool cake in pan on a cooling rack for 10 minutes, then run a paring knife around the edge of the pan and remove the sides and bottom to let cake finish cooling. Meanwhile, peel grapefruits and place wedges in a medium bowl and set aside. 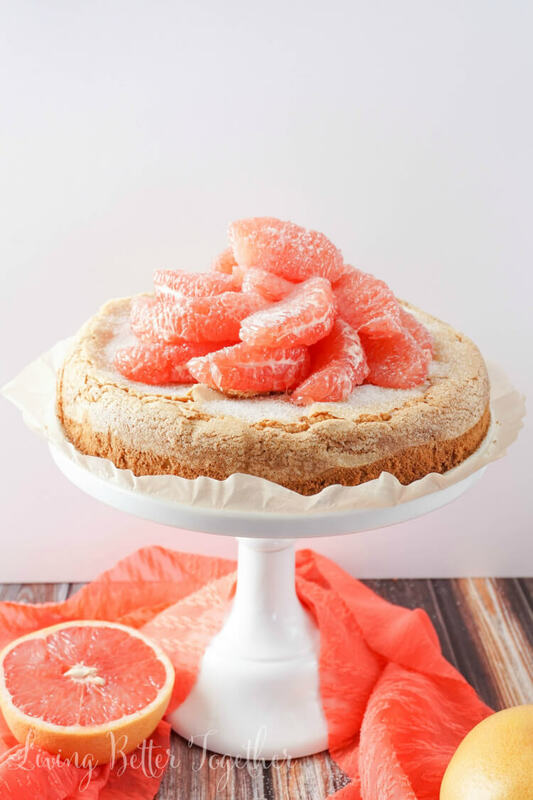 Once cake has cooled and you're ready to serve, arrange grapefruit wedges on the top of the cake and sprinkle with remaining sugar. 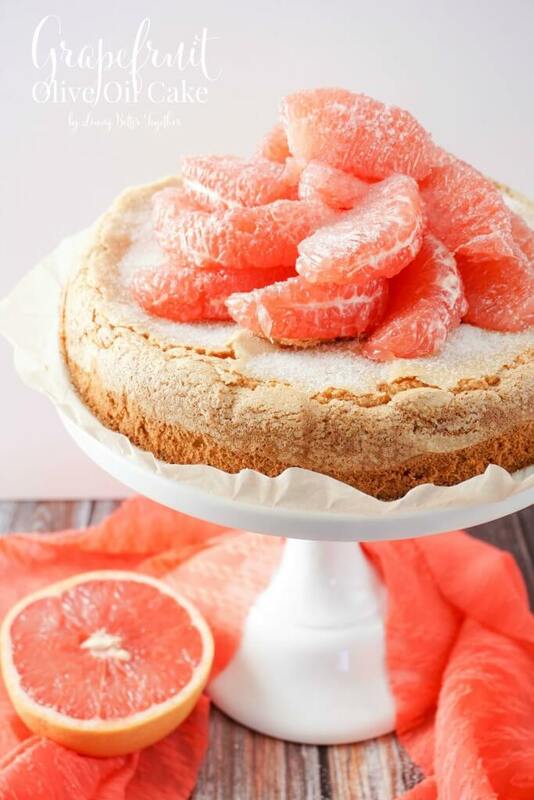 Cake can be made up to one day ahead of time, but DO NOT add grapefruits until ready to serve. Extra Virgin or regular Olive Oil can be used. I chose to use Extra Virgin because it brings out the zest in the cake, but regular olive oil will yield a lighter texture. Did you love this cake? Pin the image below to save it for later! I’ve been seeing a lot about Florida Grapefuits these days. Guess I need to go get some!! looks yummy! Oh my goodness, this is a lovely cake! I MUST try it! I’d love it if you shared this recipe over at the TSLL Foodie Friday Link up! http://bit.ly/1KvTtl7 Have a great weekend! Visiting from #FoodieFriDIY. This cake looks so delicious. 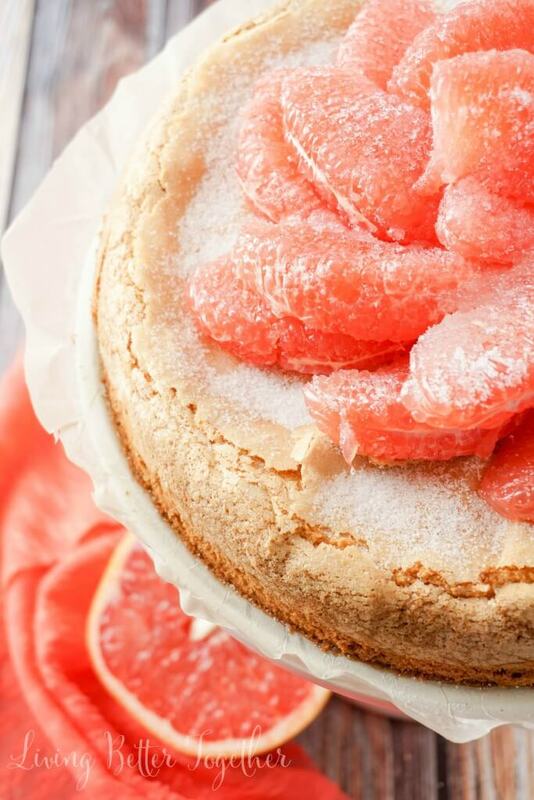 I love grapefruit and I’ve never tried an olive oil cake before. Pinning and will definitely give it a try sometime. This was my first time too, but it was delicious and I loved the texture! I have seen your cake several times, it looks so refreshing!! This recipe looks so good. And you photos really make me what to make it. I am sitting here planning on making a grocery run to just pick up the grapefruit to eat plain. Thanks for sharing. Gorgeous photos as always, and mouthwatering dessert. Yum! I don’t even really lik. Now.e grapefruit. But I want to eat this whole thing. Right. Now. I’m totally in love! can’t wait to try this out! I cannot wait to make this cake! I have never made one with olive oil better!